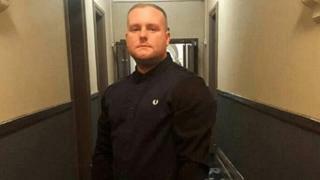 Image caption He was also a doorman at Kosho bar in Romford and described as the "happiest, funniest guy"
A former celebrity bodyguard was stabbed to death outside his home by two men armed with machetes and riding a moped, a court has heard. Ricky Hayden, 27, was stabbed in the thigh outside his home in Romford, east London, as he tried to stop his brother's scooter from being stolen. His brother Perry, 21, and father Paul, 55, were also allegedly confronted by Tommy Roome and Tarrell Hinds. Both deny Mr Hayden's murder and the attempted murder of his father. Old Bailey jurors were told the minder confronted the defendants, then aged 19, while dressed only in a pair of boxers outside his home on 13 September last year. Prosecutor Jonathan Rees QC said Mr Hayden was wounded several times in his leg and the deep cut in his left thigh damaged major blood vessels causing "profound bleeding from which his body was unable to recover and he died in the early hours of the following day". Jurors heard the defendants had gone to Gibbfield Close to look for two other brothers - Carter and Latham Jordan - with whom Mr Roome was involved in an ongoing dispute. "As it turned out, their trip to Gibbfield Close resulted in a violent confrontation, not with the Jordans but with a different pair of brothers, Ricky and Perry Hayden and their father Paul," Mr Rees said. "It appears that confrontation came about because the Haydens believed that Tommy Roome and Tarrell Hinds had designs on Perry Hayden's moped which was parked directly outside the front door of the Haydens' home address." Mr Roome, also known as Aaron and from Chadwell Heath, and Mr Hinds, who is nicknamed Ghost and from Chigwell, also face an alternative charge of wounding Mr Hayden's father with intent. A third defendant, Kevin Malamba, 20, of Southwark, south London, has previously admitted perverting the course of justice, jurors were told.